Home » ARSENAL CORNER » Aubameyang Starts: A sign Dortmund is Ready to Play Hardball or No Ball At All. Aubameyang Starts: A sign Dortmund is Ready to Play Hardball or No Ball At All. The unusual pursuit of Aubameyang by Arsenal just get trickier with the club featuring him in their weekend game against Sc Freiburg that ended 2-2. This is unusual because Arsenal does not conduct their business in public, but since Guillem Balague broke the story that Arsenal is after Aubameyang, the coverage became overwhelming, even Wenger, famous for his ability to dodge questions could not but give in to providing updates at least on two occasions. While the standoff between Dortmund and Arsenal is making gunners fans jittery, both clubs are however only waiting for who is going to blink first. It is an open knowledge that the player wants to leave, and the club’s hierarchy wants to see his back (apparently) and Arsenal needs and wants him, so basically, every factor that should make the transfer happen very quickly is there, what could be the problem? The problem is money, clearly. Arsenal trying to work within a very tight self-imposed budget, essentially, not wanting to spend a penny more than what they realized from selling other players and at the same time, wanting to sign a player in the caliber of Aubameyang. Arsenal has no hiding place now, this is not one of those pursuits that are conducted in secret and then denied when they fail to strike a deal, this negotiation is open in the public, with minute by minute twitter and social media update. 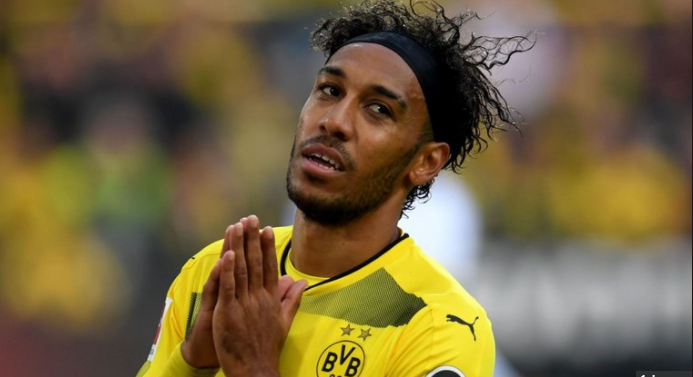 While it looks like a bad idea for Dortmund to hold on to Aubameyang, given the state of affairs, it feels like the club is ready to play a hardball or no ball at all, there is an awareness that Arsenal only have up to Wednesday midnight to get this over the line and literally no time to start looking elsewhere, hence the gunners back is on the wall. This reminds me of Thomas Lemar pursuit, which started from £50m ending with a failed £90m plus last-minute bid. This will be an embarrassment if Arsenal eventually pays exactly what Dortmund is demanding because one can argue that they could have agreed much earlier and close the deal to focus on other business and allow the player to settle in, at the same time, it will be even more of an embarrassment if Arsenal is sent back to London with their tails between their legs without signing the player, which will mean that the transfer window is wasted yet again without a major inward signing except for the one they were forced into i.e Alexis Sanchez/Henrikh Mkhitaryan swap. Aubameyang featured in his side’s 2-2 draw against Freiburg, clubs would normally exclude players going through possible transfer for many reasons- divided attention and to prevent injury etc, but that Dortmund used him is a clear sign that they are in this negotiation to get the maximum on the want-away striker or even ready to postpone his exit and Arsenal will have to put up and pay up to close the deal.